sassypants in the kitchen | discover. create. share. A sheet pan full of glazed, grilled, sweet and savory goodness! Between the ages of 12 and 15, I was fortunate to live in Hawaii. I was a military brat, and my dad was stationed at Hickam AFB on Oahu. During our time there I was introduced to a whole new world of flavor and certainly, Hawaiian food became a favorite. “Huli” is Hawaiian for “turn”, and huli-huli chicken is essentially a teriyaki chicken cooked on the grill. As the story goes, a man named Ernest Morgado used his grandmother’s teriyaki chicken recipe to grill chicken for a crowd in the 1950s. When the chicken was ready to be flipped, someone would yell “huli!” and the chicken would get turned to the other side. The recipe was so delicious that he quickly had a hit on his hands, and huli-huli chicken was born! Today you can find roadside huli-huli stands all over the Hawaiian islands. Another Hawaiian staple is Spam®, introduced by mainland military troops during WWII, and I include it in my fried rice for a bit of salty, hammy goodness. I diced the carrots and Spam® so they were about the same size as the peas, and left the pineapple just a bit bigger. Mr. Pants loves pineapple, and it gives the dish a hit of sweet that pairs perfectly with the savoriness of the other ingredients. Make sure you start with rice you’ve cooked at least the day before. This time in the fridge will help dry out the rice so it doesn’t get soggy. I made mine with brown rice in a nod to eating healthier (a perfunctory nod, like the kind you give someone you kind of recognize but who’s name you can’t remember and really hope they don’t come over and start a conversation), but feel free to use any kind of rice you like. If you make a lot of fried rice, steam a big batch, portion it, and freeze! Mr. Pants really likes my cooking. Sometimes he even loves it. This was one of those times (insert fist pump here). One of my favorite parts is the bit of char on the skin! Mix all marinade ingredients in a gallon size sealable baggie; add the chicken and marinade overnight. When ready to begin cooking, remove the chicken to a sheet pan and pat dry; cover with plastic wrap and bring to room temperature, about one hour. Do not throw out that marinade! We’ll be using it in a bit. Preheat your grill and prepare for indirect heat cooking. (I have a gas grill and I preheat the grill then turn off the two burners in the middle, leaving the outer two burners on high.) Empty the marinade into a saucepan and bring to a boil over medium-high heat. Let the marinade boil for a couple minutes to make sure all the ooky raw chicken badness is killed, turn the heat to low or simmer and let the mix reduce. You should end up with a mixture thick enough to glaze the chicken as it grills. Set the glaze aside. Grill the chicken, skin side up, on the indirect heat side for about 5 minutes to let the fat begin to render. Turn to the skin side and, still using indirect heat, grill another 20 minutes. Make sure your grill lid is closed while you’re cooking over indirect heat. When the internal temperature of your chicken reaches 150° or so, slather your reserved glaze all over the thighs and move to the direct heat side, turning skin side up. Keep the lid up and keep a close eye on things, as your chicken can easily burn at this point. If you want more char or crispness on your skin, spend a little more time skin down. Huli as needed (I like to yell “HULI” each time. It keeps my neighbors on their toes). Pull the chicken off the grill when internal temperature reaches 160° and let it rest while you finish everything else; it will continue to cook to a safe temperature of 165°. In a wok or sauté pan, heat the oil until shimmering. Add the carrots and sauté till they begin to soften. Add the garlic and Spam®, sauté until the garlic is fragrant. Add the peas, pineapple, rice, and soy sauce in Tablespoon increments to taste. Continue to stir until everything is warmed through. I’m Game, How About You? Having a hunter for a husband means a freezer full of venison. When venison is treated correctly in the field, and then in the kitchen, you get a richly flavored, lean red meat. Venison fits beautifully into a heart-healthy diet… most of the time. Once in a while, I like to thaw out a couple cube steaks and make chicken fried venison. Not something for every day, but there is no reason not to indulge occasionally! 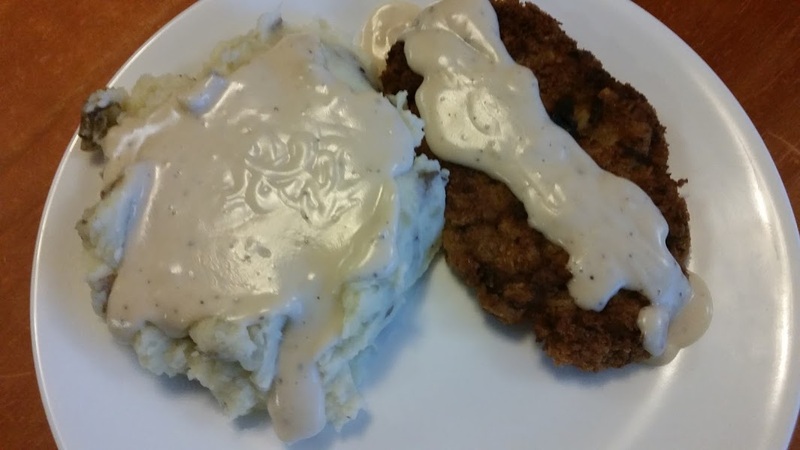 A creamy country-style gravy made with the pan drippings and some Rustic Smashed Potatoes are the perfect accompaniment; add your favorite vegetable, and you have a hearty dinner perfect for a cool-weather evening! I generally start my potatoes first as they take the longest to cook, and because they have a good “pausing point” before smashing so I can time everything to come out about the same time. (I feel that good timing is a critical part of being an excellent home cook, and it can be challenging which is part of the fun for me! Yep, I’m a cooking nerd.) I call them “rustic smashed” potatoes because I don’t peel the potatoes, and the texture is chunkier than my regular mashed potatoes. You won’t hurt my feelings if you use another potato recipe, I promise. To fry the steaks in the past, I’ve used canola oil, olive oil, butter, even reserved bacon fat. This time, I used rendered goose fat that I ordered online from Schiltz Goose Farm*, right here in my home state of South Dakota. I was on the website to order their insanely delicious smoked goose breast, and as I am wont to do when online, started wandering about the site. I was thrilled to discover they sell rendered goose fat in quantities that make sense for the home cook. Goose fat is one of those fats that is actually better for you than butter or lard because it is rich in oleic acid. What this means to people who are watching their cholesterol is that it is a monounsaturated fatty acid that can actually lower blood cholesterol levels. What it means to me is that I don’t have to feel too guilty for using it to fry in! Honestly, I don’t know how much I’d worry anyway as rendered goose fat is – heavenly, ambrosial, transcendent even. Ok, that might be laying it on a little thick, but frying in duck or goose fat really does lend a depth of flavor that, well, that transcends more conventional oils for me. I received my goose fat in a tub that fits right in my freezer. When I opened the tub, the first thing I noticed was the color. It was a creamy ivory color, definitely purer than anything I’d ever achieved with my own rendering efforts. The smell reminded me of my mom’s house as she made her famous-to-us fried chicken (maybe I wasn’t laying it on too thick when I used the word transcendent). Now on to the cream gravy! Making gravy used to intimidate me until I got used to making a white roux. Now, I find it pretty easy to throw together while the meat rests. After roasting or frying take your meat out of the pan to rest, add flour in equal amounts to the fat and drippings left behind, whisk until smooth. Add your room temperature liquid (cold, it takes forever to cook; too warm and you have lumps), add salt and pepper to taste. Whisk, whisk, whisk. Pretty soon you have cream gravy! What you don’t know is another ladle-full of gravy went on after the picture was taken. Ssshh. *I contacted Schiltz to make sure I could use their name (I would have hated to receive my first cease and desist – I mean, what do you do with that? Surely you don’t frame it like the first dollar you ever made! ), and they graciously gave their permission. I’m not receiving any compensation for talking about them whatsoever; I truly love this company and I’m so proud they’re from South Dakota too! They have a lot of different products; their smoked goose breast is a favorite on our meat and cheese board. They also sell goose liver from geese that have never been force-fed, it that’s a concern of yours. I’ll definitely be buying some when I’m ready to try my hand at making paté! They just recently updated their website; it’s beautiful and has a wonderful FAQ section that includes great cooking tips and some interesting information about their geese! Place the cube steaks in a gallon size ziplock and pour in enough milk so all steaks are submerged. Lay flat on a baking sheet and place in the refrigerator overnight, flipping once (the lactic acid in milk works to tenderize the meat, as well as draw a lot of blood out. Normally I love the rich taste of venison, but it can be a little strong. This works to ensure there is no gamy flavor.). A half hour before you plan on cooking, take the meat out of the milk. Pat dry with paper towels. Place on a plate and cover with plastic wrap. Preheat the oven to the lowest temperature setting, usually 150-200° (my old 60’s oven goes down to 140°, so that’s what I use). Place the flour in a pie plate or like container. Break the eggs into another pie plate and beat to incorporate the whites and yolks. Place two baking sheets and the seasoned panko within reach. Dredge a cube steak in flour, dip in the egg and place on a baking sheet. Repeat until all the steaks have been treated to their flour dip and egg bath. Add the panko to the flour, using a fork to stir well. Dredge the steaks one-at-a-time in the flour and panko mixture and place on a clean baking sheet. In a large skillet over medium heat, heat the oil or fat. When it begins to shimmer, take a pinch of flour and drop it in the oil. 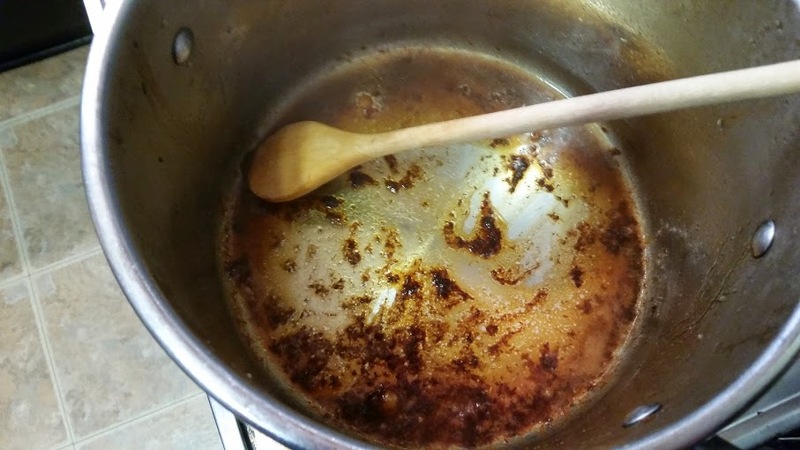 If the oil and flour sizzle immediately, your oil should be ready. Place a cooling rack atop another clean baking sheet (washing and drying the egg-y one, if necessary), and keep nearby. Place as many steaks as will comfortably fit in your frying pan. Do not crowd them! Fry the steaks until golden brown, about 2 minutes per side. Remove from the pan and place on the cooling rack, put the baking sheet into your pre-warmed oven to keep warm while the rest of the steaks cook. Repeat as necessary until all your steaks are golden brown! 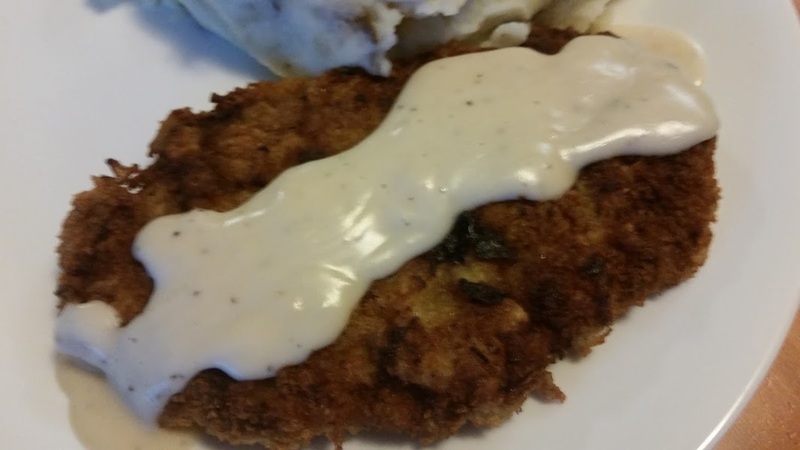 While the steaks rest in the oven, you want to start your cream gravy. Lower the heat under your pan drippings to medium-low. Sprinkle the flour in a bit at a time, whisking constantly until you have a texture like wet sand. Continue whisking for a couple minutes to help cook out the raw flour taste. When you see the roux begin to change color, begin adding the milk slowly, whisking constantly. Add the salt and pepper, and continue whisking until the gravy is smooth and thickened. Add more milk if needed, tasting and adjusting the seasoning as needed. Plate the steaks and pour or ladle the gravy over the top! Place the cubed potatoes in a medium stock pot, add cold water to cover by about an inch. Add the salt. Over high heat, bring the potatoes to a boil. Immediately turn the heat down until the potatoes are simmering and let them simmer for about 15 minutes. Test doneness; a fork should easily slide right through the potatoes. Continue simmering if necessary, about 5 more minutes. Drain the potatoes in a colander. Add back to the stock pot and place on low heat. Stir gently until dry, about a minute. Begin smashing the potatoes with a potato masher, slowly adding the milk. Stop smashing when you have reached the chunky-to-smooth ratio you like. Spoon the potatoes into a serving dish. Make a well in the center of the potatoes with the spoon, and add the softened butter to the well. One of the sweetest dates Mr. Pants ever surprised me with was a late night trip out of town to lay under the stars and watch the Geminid meteor showers. The Geminids occur in December and it was cold, even with all the blankets! 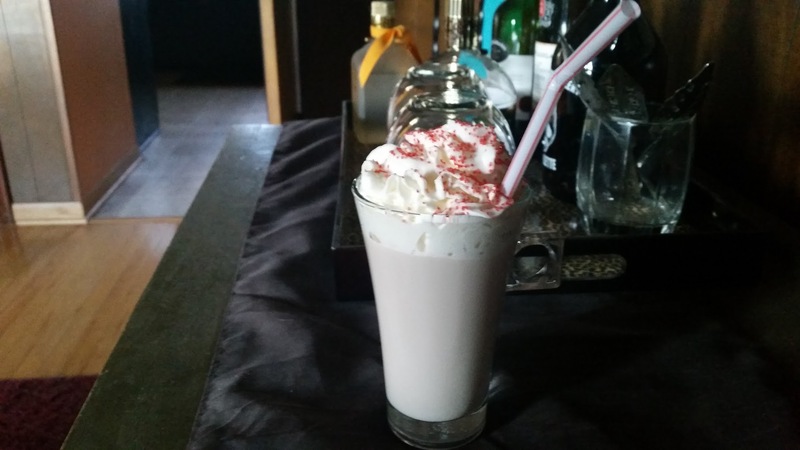 To honor that date I created a drink I called the Geminid Kiss which contained our favorite flavor combination of white chocolate “kissed” with raspberry, in a hot drink. It was perfect, even if it only gave us the illusion of warmth! I just had to add some sprinkles. I love bling! This went down way too easy! About 15 minutes before you want to serve your drinks, rinse your martini glasses but do not dry them. Place them in your freezer to chill. Fill a cocktail shaker half way with ice. You want to do this before adding the alcohol to chill both the shaker and the ingredients you’ll be using. Pour your ingredients into the shaker and shake vigorously until the outside of the shaker becomes frosty. Strain into your chilled martini glasses. I want to stress that it is perfectly acceptable to use a powdered white hot chocolate mix for this drink! In fact, I use Safeway Select White Hot Chocolate powder mix when I’m not feeling ambitious enough to make it from scratch. And, I just discovered a K-Cup white hot chocolate from Timothy’s that I want to try in my Keurig! 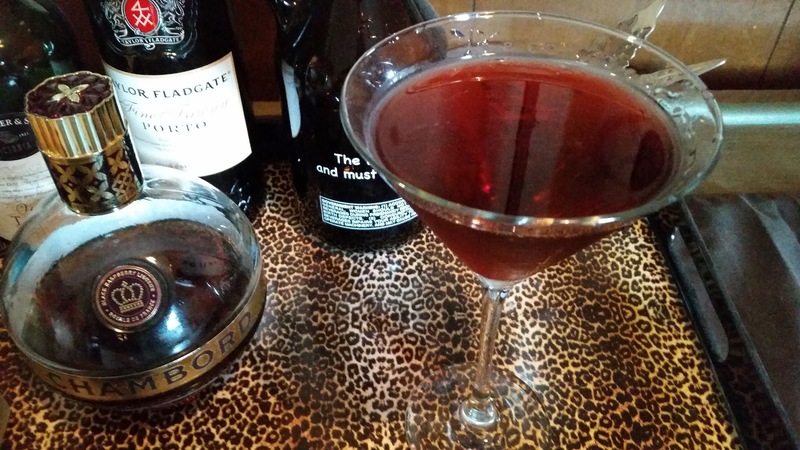 Also, I used Chambord because I had it on hand after a special occasion. There are less expensive options out there. There is no judgement here, use what you like! Mix all ingredients in your favorite hot chocolate mug. Garnish with marshmallows or whipped cream if you wish. Drink while snuggled with your significant other – or your favorite fuzzy animal. Or both, or perhaps they’re one in the same. No judgement, remember? Combine milk and white chocolate chips in a medium saucepan and warm over medium-low heat, whisking constantly, until the chips have completely melted. Whisk in the vanilla extract. Pour into mugs and serve! Easter is over but for the hardboiled eggs, jelly beans, and leftovers. Glorious, hammy leftovers. But this post isn’t about all the ways to use your leftover Easter eggs, candy, or even that ham. This is about my happy, homely little accident. That’s right, homely, not homey. ‘Cause this asparagus sure ain’t purty. These stalks might not be pretty, but they’re pretty delicious! The kids were with their mom for Easter this year, so it was just Mr. Pants, the doggies, and yours truly. We decided to make a huge bone-in ham as usual because, well, because “glorious, hammy leftovers”, remember? There were a couple other favorite holiday dishes beloved of Mr. Pants, and I decided I would treat myself to roasted asparagus. I say “myself” because Mr. Pants does not eat asparagus. More for me! I turned the oven off when the asparagus was just about done, finished the rest of the dishes, carved the ham, aaand promptly forgot I had asparagus in the oven until we started cleaning up after dinner. Into a container the asparagus and juices went, like the rest of the leftovers, to be eaten later. I got home from work this afternoon and found myself hungry for a snack. Aha! I have leftover asparagus in the fridge that I’ll just nuke a little bit and warm up! A light snack that I could nibble with a favorite veggie dip. Now, here’s where the happy accident part comes in. I nabbed a cold asparagus spear before placing the container in the microwave and took a bite. I tasted asparagus. I tasted the sea salt, olive oil, and Ghee the asparagus had been roasted in. I tasted…. Ambrosia. Because they had been left in the hot oven, they were roasted longer than usual. They were shriveled, but had achieved a caramelization I hadn’t had with asparagus before. Then during their stay in the refrigerator they had continued to soak up all the flavors of the fruity olive oil and nutty Ghee; even the brininess of the sea salt seemed intensified. While the stems were soft, the tips were still nice and crunchy from the roasting. I can’t decide which end I liked best. I had made myself a lemony, garlicky, dill-icious (see what I did there?) dip that’s perfect with the brightness of asparagus, and I’ve included the recipe. I even served some with my snack. I just didn’t find myself using it, preferring to eat the cold spears on their own! If you want to use the dip, I suggest you make it a couple days ahead of time to give the garlic time to mellow and the flavors time to meld. A quick word about Ghee: this is a clarified butter used in Indian cooking. It’s made a little differently than the clarified butter you dip your crab legs in. Instead of removing the milk solids, the solids are left to caramelize at the bottom of the pan, leaving the Ghee with a nutty flavor. It also has a higher smoke point than regular butter, so it’s perfect for high heat roasting. Find it in the organic section of your grocery store, at your local health food store, or online (I know Amazon carries it). It’s a little spendy (I spent about $8 for a 7.5 oz jar at a local store), but it doesn’t take much to impart big flavor, so a small jar goes a long way. It’s shelf stable even after opening (as long as you store it in a “cool, dark location”), so it lasts a long time, too. Okay, that was not a quick word about Ghee, but don’t you feel better informed now? Well, that’s what I’m going to let myself believe. You don’t have to use it here, but I honestly think it added to the overall scrumptiousness of the asparagus! 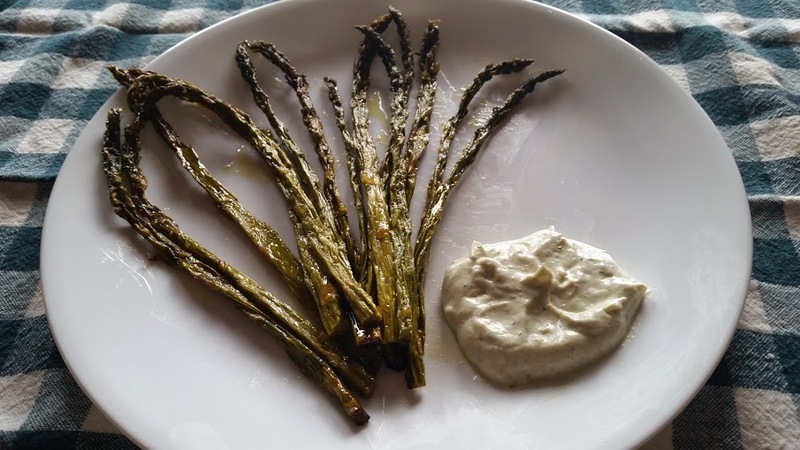 This asparagus is delicious right from the oven, but I encourage you to either make it the day before and serve cold or at room temperature, or make extra so you can give yourself a delicious snack the next day! Mix all ingredients together and refrigerate until ready to use. I like to prepare this a day or two ahead of time, then I can adjust amounts of garlic, lemon zest, and dill to taste. Toss the asparagus in the oil and Ghee mixture (or just oil if omitting the Ghee), and sprinkle with the salt. Spread the asparagus out on a lined sheet pan and roast for about 30 minutes or until the asparagus achieves caramelization (this will depend on the thickness of the stalks). Happy New Year! I hope the beginning of this year finds you and yours happy and healthy. I haven’t posted in a little while. I’d like to blame being on night shift at my “real job”; I’d like to blame Assassin’s Creed Rogue for the PS3; I’d like to blame fear that I don’t have anything interesting to say. I’d like to blame these things, but I can’t. No matter the reason, there’s no good excuse! I haven’t posted because I made a conscious decision to do other things; like sleep, game, etc. So here I am with a new post and a fresh start to the new year! 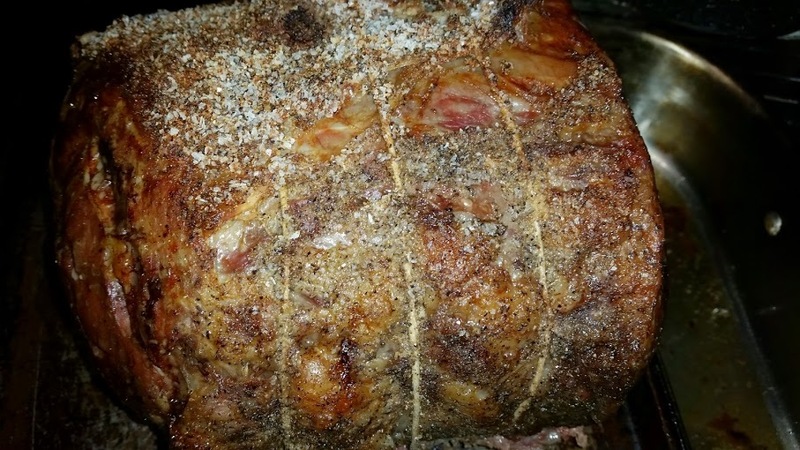 This standing rib roast – also called a prime rib roast – is ridiculously easy, and so delicious! 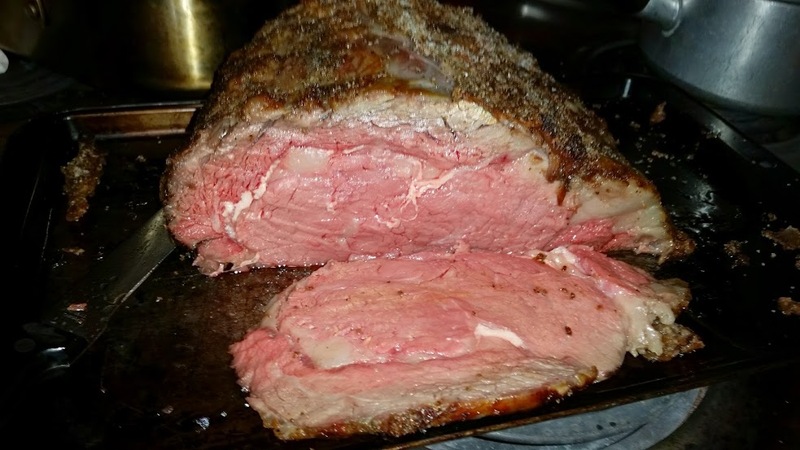 I’ve been a stickler for not calling a standing rib roast a prime rib roast, because I always thought that prime referred only to the USDA grade Prime, and most beef sold in grocery stores is Choice (or sadly, Select – stay away from Select if you can!). However, I recently learned that a prime rib roast refers to primal. Butchers break down whole sides of beef into primals, and a standing rib roast is taken from the rib primal. There are lots of opinions about what kind of roast to buy; like seeking out dry aged beef, or asking the butcher to cut your roast from ribs 6-9, etc. I don’t worry about any of that. I can only afford prime rib when it’s on sale, and I take what I find from Safeway. A couple times a year, they drop their roasts down to about $6.99 a pound, and this is when I pounce! The only thing I insist on is a bone-in roast. The butchers at my Safeway actually cut the bones away from the roast, then tie them back on. I love this method and will always ask that it be done if it isn’t already. You get all the flavor and insulation from the bones, and the benefit of using them in lieu of a roasting rack, but none of the hassle of cutting the bones away after the roast is done. When choosing your roast, count on one pound of bone-in per person. The beauty of this method is it doesn’t matter what size roast you get. This method works with any size roast, with no changes. Seriously. No matter the size of your roast, you are going to have beautiful, perfect, rare to medium-rare beef. I like to start this roast several days ahead of time. I salt it liberally and place it, uncovered, on a rack in the refrigerator about 2-3 days before I cook it. Now, I’m sure you’ve heard you shouldn’t salt your meat ahead of time; that this draws the moisture out of the beef. This is true. But what you may not know, is that left to sit, the salt begins to work with the muscle fibers and is actually drawn back into the meat. You’re now left with well-seasoned beef, ready for you to cook to juicy perfection. Because I really like to let the flavor of the beef shine through, I don’t use a lot of different seasonings. I use my Everything Salt, which is a perfect blend of salt, pepper, and garlic. It’s a wonderful base seasoning and really allows the flavor of the meat to stand front and center. It’s also very easy to add to, too. Start with the Everything Salt and then add crushed rosemary for lamb, crushed fennel seed for pork, sage for chicken, the possibilities are endless. The recipe makes a lot of Everything Salt, and you’re certainly not going to use all of it here. I put some into little 4 oz tins and gave them as stocking stuffers. Because of the method we’re using to roast the prime rib, there are almost no drippings left over with which to make the jus. I use (gasp!) McCormick’s powdered Au Jus mix, prepared according to package directions. What little drippings I am left with get scraped up with some of the prepared jus and poured back. The horseradish cream is easy, too and is best prepared a day ahead to let the flavors meld. Mmm, look at that beautiful salt crust! Salt the top of the roast heavily with Everything Salt. Place on a rack in a baking sheet and leave, uncovered, in the refrigerator for 2-3 days. Remove from the fridge at least one hour before roasting. Pre-heat the oven to 375. Pat dry the roast with paper towels and re-apply the Everything Salt, covering the top of the roast. Place the roast, ribs down, in your roasting pan. There is no need for a roasting rack as the ribs do that job for you. Place on the middle rack of your oven and roast for one hour. Turn the oven off and walk away for 3, yes three, hours. No matter how tempted you are by the smells wafting from the oven, DO NOT open the oven door! A half hour before you’re ready to eat, turn the oven back up to 375 to reheat the roast. Take out of the oven and remove the roast to a rimmed baking sheet. Tent with foil and let sit for about 20 minutes. While your roast is in the oven for the final half hour of roasting time, prepare the jus according to package directions. If you want a full 6 cups of jus, prepare one package at a time, using the 3 full cups of water the directions call for. Pour the first batch into a serving vessel, rinse your pot and prepare the second batch. If you want to prepare both packages at once, only use 5 cups of water. I’m not sure what the science is behind it, but if you use 6 cups of water at once, it will taste too diluted. Keep the jus warm (I usually just pop the serving vessel into the microwave and keep the door closed). Once you’ve removed the prime rib from the roasting pan, pour off most of the fat. Add some of the prepared jus to the pan. With a wooden or silicone spoon, scrape up any fond from the bottom of the pan. Pour this back into the rest of the jus and stir well. A day before your dinner, mix all ingredients well in a food storage container and refrigerate. Before serving taste, and add more horseradish if desired. *Everything Salt: Mix together 1 cup kosher salt, 1/4 cup garlic powder and 1/4 cup ground black pepper (freshly ground, if possible). Store in an airtight container. Cut the kitchen string away from the roast, remove the bones. You can cut the bones into single servings for guests to gnaw on, or save for another use (someday I’ll share a Deviled Bones recipe!). Slice the roast into desired thickness, about 1/2 inch to one inch slices. Serve with the jus and horseradish cream on the side. I like to serve with a potato dish and roasted vegetables; I don’t have any set sides, it’s usually something different each time. Spatchcock is Not a Dirty Word! Spatchcock, spatchcock, spatchcock. Are you getting the idea that I’m only posting this because I like to say spatchcock (heehee)? Yeah, that’s got a lot to do with it (apparently my inner child is a 13-year old boy), but more important, this chicken is delicious! To spatchcock (snort) a chicken, is to cut out the backbone and flatten it. This will ensure the bird roasts evenly, so the thigh is cooked through and the breast is still juicy. You also get crispy skin on the entire bird, and because it’s flattened, it roasts much more quickly than a whole bird. 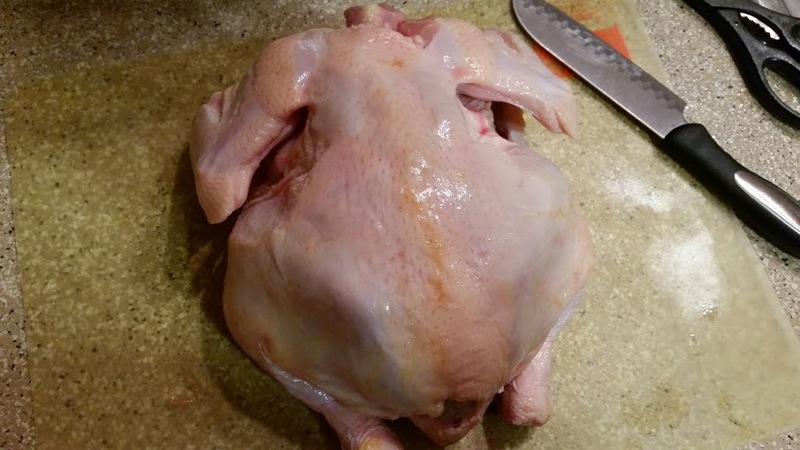 In order to spatchcock (giggity – OK, I think I’m done now), place the bird, breast down, on a cutting board. With heavy-duty kitchen shears, cut along both sides of the backbone and remove. Reserve the backbone for stock. * Flip the bird over, place the heel of your hand on top of the breastbone, place your other hand on top of that hand, and push down – HARD – to crack the breastbone. You now have a beautifully spatchcocked chicken! Your bird, breast-down, ready to be spatchcocked! Remember to save that backbone! This bird has been thoroughly rubbed and massaged. I would think it spoiled, but the chicken would probably disagree. See those dark spots under the skin? Herb-y goodness! By the way, this technique is also called butterflying. This is not nearly as fun to say, and therefore, will not be used here. *Reserving parts and pieces for stock: You have a stock bag, right? You know, the big zip top bag where you place all your bones and bits till it’s time to make stock? You don’t?!? Well, you can start now! Place the reserved back bone and your chicken carcass in a freezer-duty zip top bag, and place in freezer. Ta-dah!! 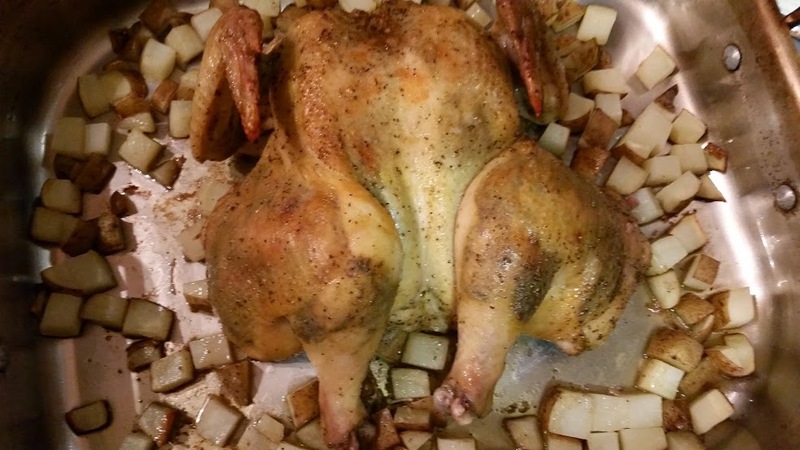 I roast my bird on top of some cubed potatoes. It rids me of the need to use – and then clean – my roasting rack, and my potatoes benefit from all the drippings from the chicken. Because there is a lot of oil in the wet rub, and fat from the chicken, I don’t toss the potatoes in oil ahead of time; they still turned out crispy on the outside and soft on the inside. Mix together your seasoning, oil and juice (if using) to make a wet rub. If it is too thick, use a little more oil; you want it to be a little runny. Pat dry the spatchcocked chicken thoroughly with paper towels and place in a large bowl. Gently run your finger between the skin and meat of the thigh, leg, and breast; be careful not to tear the skin. With your fingers or a small spoon, place some rub under the skin. Rub the rest of the mixture on the outside of the bird, all over. Massage it a bit to get the rub under the skin distributed. Place the bird in the refrigerator overnight, uncovered. This will help to tighten the skin, resulting in crispier skin. You may need to squish and squeeze the bird a bit to make it fit your bowl; this is fine, you just want as much skin exposed to the air as possible. Take the bird out of the refrigerator about 30 minutes before roasting. Lightly oil or spray a large roasting pan. Spread cubed potatoes in the bottom of the pan. 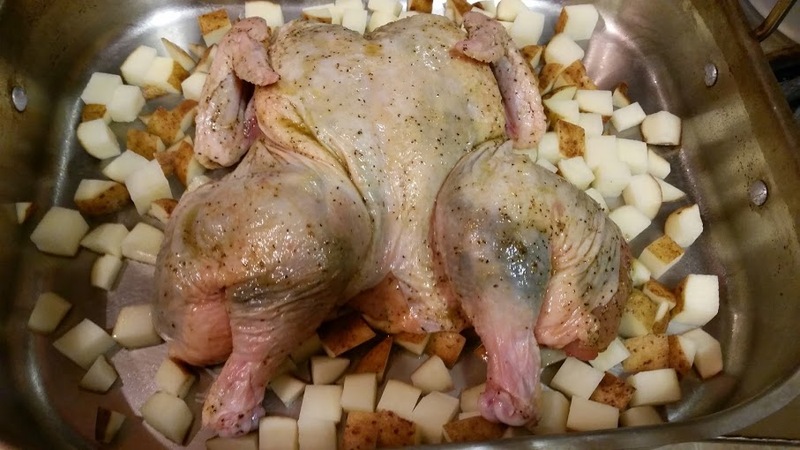 Place the chicken, skin side up, on top of the potatoes. Place the roasting pan on the middle rack of the oven. 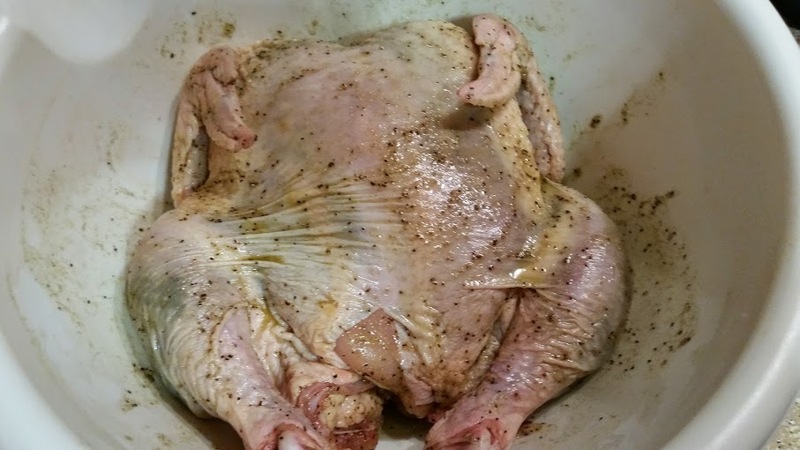 Roast until an instant-read thermometer registers 165 degrees when inserted into the thickest part of the breast and of the thigh, about 35-45 minutes. Be careful not to touch the bone when testing doneness, as the bone will be hotter than the meat. Remove the chicken to a plate, tent with tinfoil and set aside to rest, about 15-20 minutes. Meanwhile, stir the potatoes about with a wooden or silicone spoon, scraping up any brown bits. Place the roasting pan back in the oven and continue roasting until the potatoes have crisped up a bit. 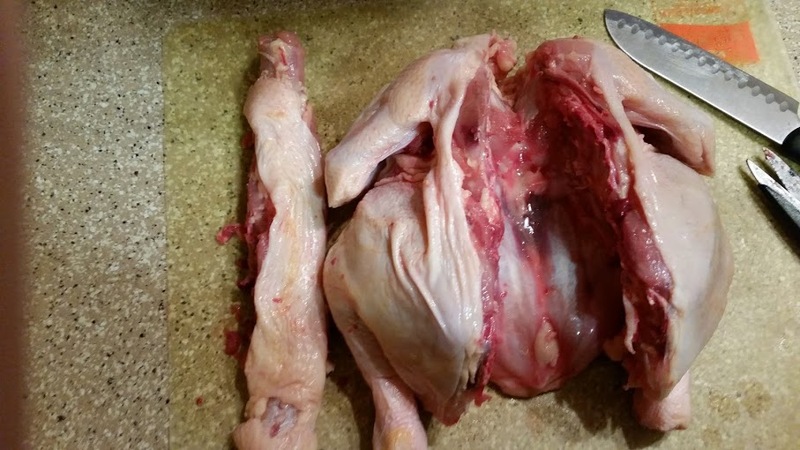 With a sharp knife, cut the leg quarter (thigh and leg) away from the breast of the chicken. Cut the leg from the thigh at the joint. Cut the wing away from the breast. At the base of one side of the breast, slice horizontally until you hit the breastbone. Slice vertically at the breastbone to the horizontal cut you made, until you can remove one entire breast. Repeat with the other side. Cut the breast into slices. Plate some potatoes and chicken, serve, and prepare for the compliments! Filling, delicious, and pretty too! As a kid I hated ham and bean soup. Hated it! My brother loved it, and would request it for his birthday dinner. Ahem. He said he loved it. I really believe he requested it because he knew he could tolerate it, and that I would hate it. Next time, I would cut my fat smaller to render more quickly. Once we became adults, and no longer had to eat what was put in front of us, I didn’t touch ham and bean soup again until I was 30. My brother had requested it for his birthday dinner (ok, maybe there was something to that, after all), and I decided to try it again, knowing palates can change. Same bean soup I grew up hating as a child. Wow. Two bowls later, I sat dazed and bemused, wondering if Mom had any plastic containers so I could take leftovers. This is the fond, or brown yummy bits that add so much flavor! I’ve since made my own and made some changes to my mom’s original recipe. When she was making it for us when we were children, Mom had to be as economical as possible. She used water and the bone from the Christmas ham, and I now use chicken stock and a picnic ham bought just for this soup. An extravagance, yes, but I only make this soup once or twice a year so I think it’s well worth it. I’ve also added sage because I love the woodsy flavor it adds. I love the softness of Great Northern beans instead of Cannellini beans for this recipe, but the choice is up to you. See the ham bone peeking out? This will continue to add flavor to your soup. Also, a note about draining and rinsing your canned beans before use. I generally do not drain them when I’m using them in a soup, because I like the extra flavor and volume I get from the juices. I know some people have an aversion to using the juice, so if you will be draining and rinsing your beans, you may need some extra chicken stock or water to make up for the lost volume. You should have about 6 quarts of soup when all is said and done. 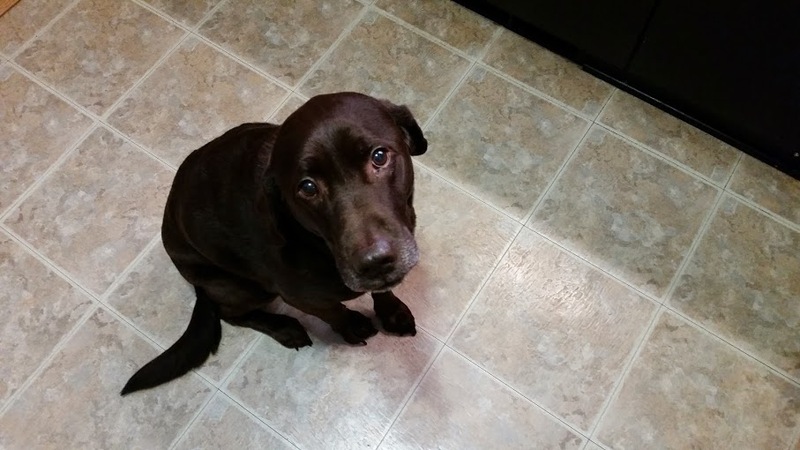 Meet Jazz, our ever-hopeful chocolate Lab. 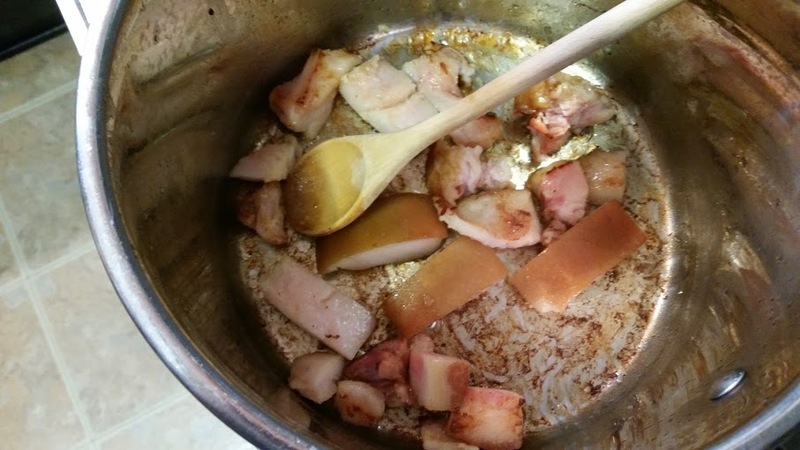 In a large (over 6-quart) stockpot, render the fat from the reserved trimmings over low heat until you have about two Tablespoons of liquid fat. With a slotted spoon, remove the solids from the pot and discard. Turn the heat up to medium-high. Add the garlic and sage, and saute until the garlic is brown, but not burnt, about 2 minutes. Add the chicken stock slowly, scraping the fond (yummy brown bits) from the bottom of the pot. Add three cans of beans with their juice, and just the juice from the remaining three cans. Blend with an immersion blender until the beans are completely pureed. You can do this in a regular blender as well, working in batches. If you use a regular blender, add the puree back to the stockpot before continuing. At this point, assess whether you’d like more “juice”, or if you’d rather have lots of beans. If you want more puree, then either blend one of the final three cans in your regular blender, or add to the stockpot and puree with your immersion blender. If you want more beans, add the final three cans to the stockpot. Add the cubed ham and the ham bone. Lower the heat to medium and heat the beans and ham through, stirring occasionally. 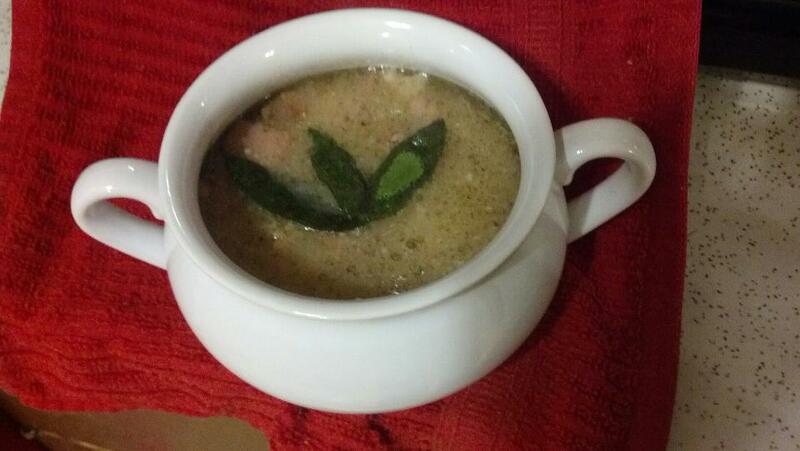 Ladle into large soup bowls, and garnish with fried sage leaves, if desired. *If you will be garnishing with sage leaves, fry them in your rendered fat until crisp, before adding the garlic and minced sage. Carefully remove them with tongs, and drain on a paper towel. 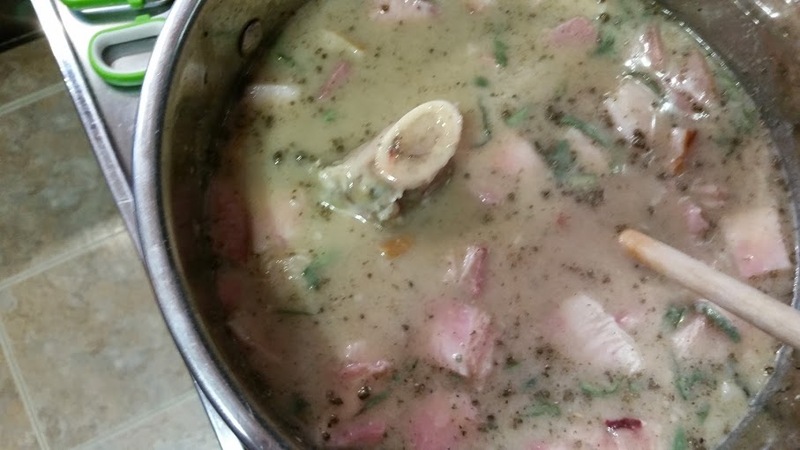 If you’re worried about the look of the soup and want to remove the ham bone, do. I leave it in until the soup is gone, because of all the flavor it adds and continues to add. You will notice I did not use any salt in this soup. Once it has had a chance to simmer for a while, taste and then determine whether salt is needed. I find that the saltiness of the ham and of the beans is plenty.